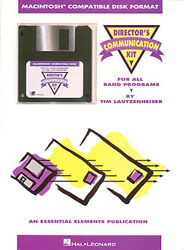 The Director's Communication Kit is a package every school music educator should not be without. Contains a disk full of important letters you can edit or send as-is to students, parents, school officials, administrators, politicians, etc. Topics include grading, recruitment, program support, concert invitations, and more. Saves time in creating the communication you need to prosper, and helps keep you from missing important points when writing to important people.